[blog] that Arashi bond: is it real, a myth or just urban legend? I’m writing this while watching the ARASHI BLAST IN HAWAII live documentary for the nth time. But this post has been writing itself in my head for weeks now. Alas, my thoughts couldn’t write themselves. an ex-manager writing a “tell-all” book on Arashi, implying that the group is not what it seems to be. Well, psycho Cyzo exists to bring Arashi down so most Arashi fans have learned to laugh and shrug their shoulders every time it comes out with trash. On the other hand, I don’t think Arashi fans are delusional to the point they believe that Arashi’s lives revolve around the group and they are joined at the hip even when they’re not working. I mean, these guys are not only different in personalities but they also have their individual lives. They have their respective families, friends, interests and hobbies. It would be too much if, even after work, they still stick together when they already spend majority of their days together. Two days to film their weekly variety shows, maybe magazine pictorials and interviews together, recordings, music-related filming, meetings and when it’s concert season, rehearsals almost every day. Do they still have to be together in their downtime? And that’s what Nino was trying to say; it doesn’t mean just because they don’t hang out outside of work, they are not close or they are not friends at all. Is it not enough they share the same dentist, among other personal details? I don’t think they’d last 16 years if they stick together all the time, or even lived together under one roof, considering their extreme personalities. As they said in a previous interview, there’s no problem of living together but sooner or later, one would stop coming home. One thing about Arashi, they never fed their fans any delusion of any bond. That so-called “Arashi bond” came from the media and fans who watched their earlier shows and saw their natural chemistry on TV. Even until now, when they are seasoned hosts and entertainers, it still feels like I’m eavesdropping on their conversation whenever I watch them–not so much on VS ARASHI but on SHIYAGARE–that sometimes they even forget they have a guest. It’s not deliberate though and no amount of script could cover up any awkwardness or cracks in their armor, if any, especially during unguarded moments and there are bound to be in their variety shows. But their public interaction is so natural it’s either they are just good actors or they’re just comfortable with one another. Funny thing is, they can’t even define that “bond” or qualify it as “family” or “friends”. To them, Arashi is not family nor friends nor colleagues but a “genre” all its own. And I guess that much is obvious that only the five of them can understand what they mean to one another since they have a shared experience, and to a certain extent, a shared life; and most importantly, shared goals and dreams. Those shared goals and dreams are very evident in the BLAST documentary when fans are finally afforded a glimpse on how Arashi is behind-the-scenes. When was the last time they had a concert BTS? Was it for HOW’S IT GOING (2003) with Nino doing that crazy dance backstage and Riida crawling over the seats in the bus? They’re not half as crazy anymore in BLAST, though they still have that dorkiness about them. After all, they’re adults now though one thing hasn’t changed, that focus on their work even during rehearsals, under the punishing heat and the unrelenting rain. You’d think they’re already performing live from their rehearsals alone and the way they go over their performance meticulously while occasionally clowning around, the way they are hands-on with their concerts and how they interact with their equally hardworking staff, is just so inspiring and heartwarming to watch. And somehow, it makes you feel you are part of this whole production yourself. Without a doubt, they have become such a strong brand and I’m sure they are aware of that. Now, are they just a business partnership as what Cyzo wants to make it appear? Arashi ain’t stupid to jeopardize what has brought them success. They know that so-called bond is their strength. And just like any relationship, it needs to be nurtured, and at the same time, given enough space to be organic for it to flourish. And this brings me to the “tell-all” book of ex-manager-san. The book covered until 2002 so obviously, the narrative is already dated. It portrayed a young Arashi struggling as a group, which is typical when you throw strangers together; an arrogant Sho, an insecure Nino, a diva Jun and the underdog Tennen pair (Aiba and Riida). As many Arashi fans pointed out, tell us something we don’t know. We have heard these stories from Arashi themselves, told in jest most of the time. But whether it’s accurate or not, and whatever the agenda was, nobody knows except for ex-manager and Arashi themselves. But that book, and the “dirt” it seeks to dig, won’t change the way I appreciate and love Arashi. I think Arashi fans are under no illusion that these five dudes had it easy from the get-go. Much as they struggled as a group, for sure, they also struggled individually. Even normal people like us with our obscure lives and work struggle too, how much more idols like them who have to do all that under the glare of the spotlight and under the watchful eye of their handlers, media, fans and the general public. Certainly, it’s not a walk in the park. And that’s what makes Arashi special, the journey that they had taken to get to where they are now, and the path that they are still trekking. As what Jun said, the Hawaii concerts–with the chopper–were symbolic of the stop that they are making on their way to what still awaits them. So is the Arashi bond for real or is it just a myth or urban legend? 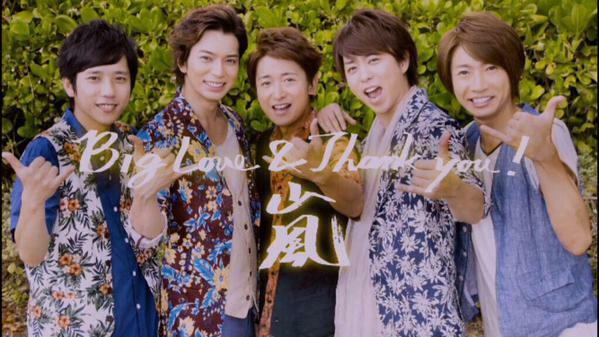 Let the 16 years (and counting) of Arashi speak for itself. The answer is right there. I am glad someone like you could depend and really explain how we see Arashi’s bond. They were not the first one to define how their relationship with each other are, it was us the fans and the media who kept an eye with them. What we saw with them is real, which is we rarely see in other groups. And for them to stay that long together, even if you say that their relationship is just business-like, if you really can’t stand the person or the group, you will really quit at it, or it will at the least, affect your performance. So far, I haven’t seen anything like that in Arashi. I have been a fan since like 5-6 years ago. Arashi still gives me the same feeling and admiration not just for them or their image, but with how their relationship with each other goes. Still looking forward for another 15 years of Arashi..
Haha yes basically the tell-all book seems to be about the growing up pains of Arashi. Can still be interesting if put in the context of what they have become and how they have grown up. But I think the agenda was more to destroy the image of the group as a closely knit one. Unfortunately, seems didn’t succeed as Arashi fans were just so blasé over it? Lol that’s why I love this fandom. More of a reflection of Arashi too. They never let anything bring them down, they just get up and brush themselves off and continue. I haven’t seen the full documentary yet (although the disc is still in my dvd player, waiting) but I liked the part when Sho talked about his issues with being known mostly for their closeness. It’s a strange thing, I guess – even when it’s natural, I think they can’t help but become more aware of their own interactions after all the media and fans’ comments on their bond. But I had this conversation with a (non-Arashian, non-JPop fan) friend about why I like Arashi so much and I said it’s because of how close they are, and she asked how would I know if it’s real? I do think it gives them pressure to a certain extent to maintain that “closeness” and no matter how natural it is, it might make them self-conscious too. which I don’t want to happen because we like them for their natural camaraderie. and I can just imagine how frustrating to a certain extent it is if they’re known for that and not recognized for the hard work that they do. I remember how giddy they felt when they sang the drama theme for the Shun-Toma drama because it made them feel like “real artists”. to us, Arashi is so successful, realizing things beyond their dreams, but I’m sure there are still a lot that they want to accomplish both as a group and individually, and be recognized for those. that said, they never fail to surprise me. I’ve been a fan for a decade this year and they never cease to amaze me. like this Blast in Miyagi… they always do something that makes us proud to be their fan. thanks to them, I see the positive side of fangirling and that it’s not a total waste of time t be supporting idols seeing how they not only work hard to make us fans happy, but on how they also give back to the community that has given them so much. I mean, people would have to be really deluded to think that that they are, as you say, “joined at the hips” even after the work day is over. If you think about it, even regular working adults don’t spend that much time with their own family and friends, how can you expect that from them. Their bond is something special, but yea, you’re right, it’s not exactly that of family or friends. I think it’s something in between: closer than just simply friends but something that can never replace family. After all, you don’t have to spend 100% of the time together to understand someone, be close with them, and appreciate their presence, right? When i saw Aiba carrying the plastic bag, the first that came to my mind is it’s Nino’s medicine. And it seems like Nino was the time keeper for them since he is the one that carries the walkie talkie when they are getting ready to board the heli. Wow! How can you fake something for 15 years? They are all good actors, but I don’t think that they will be able to fake it for more than 15 years. No matter how professional they are, they won’t last for even five years if they do not genuinely get along. Also, it is unfair to say that they do not really get along just because they have other sets of friends and they do not go out that much after work. They also have their own lives aside from being in the band. They are not shut-ins, for heaven’s sake! This pisses me off. They are really trying to put Arashi down. People are not dumb. Fans would have noticed a long time ago if they do not really get along. Haters cannot discredit Arashi with all the flak they are throwing at the group’s singing ability because the members themselves acknowledge that they are not great singers, and we fans know that, too. So now, they are trying to pull the group down by attacking its strength – the members’ strong bond. Eye roll for Cyzo the Psycho. Better luck next time. Haha!